The Bearded Collie's history is a combination of fact and legend. Kazimierz Grabski, a Polish merchant, reportedly traded a shipment of grain for sheep in Scotland in 1514 and brought six Polish Lowland Sheepdogs to move them. A Scottish shepherd was so impressed with the herding ability of the dogs that he traded several sheep for several dogs. 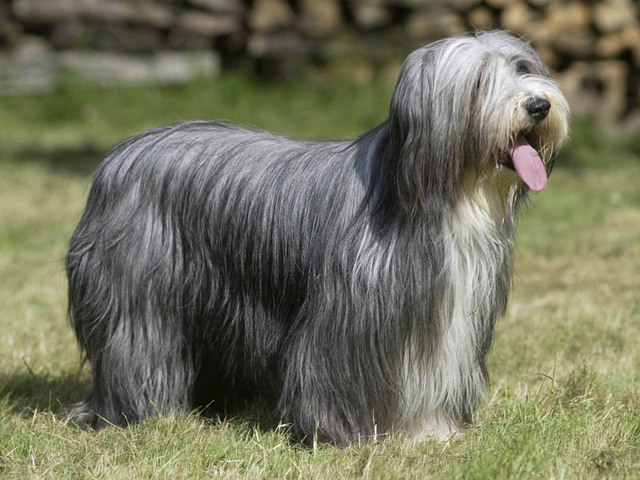 The Polish sheepdogs were bred with local Scottish dogs to produce the Bearded Collie. It is generally agreed that Mrs. G. Olive Willison founded the modern Bearded Collie in 1944 with her brown female dog, Jeannie of Bothkennar. Jeannie was supposedly a Shetland Sheepdog, but Mrs. Willison received a Bearded Collie by accident. She was so fascinated by the dog that she wanted to begin breeding, so she began searching for a dog for Jeannie. While walking along the beach, Mrs. Willison met a man who was emigrating from Scotland; she became the owner of his grey dog, David, who became Bailie of Bothkennar. Bailie and Jeannie of Bothkennar are the founders of the modern breed; there are only a few other registrable blood lines, preserved in large part by the perseverance of Mr. Nicolas Broadbridge (Sallen) and Mrs. Betty Foster (Bredon). These are based on Turnbull's Blue-a Bearded Collie from pure working stock, registered in ISDS when ISDS still registered non-Border Collies. He sired three litters of registerable Bearded Collies. The breed became popular during the last half of the 20th century-propelled, in part, by Potterdale Classic at Moonhill, a Bearded Collie who won Best in Show at Crufts in 1989. The Bearded Collie Club celebrated its Golden Jubilee in 2005.The bearded collie is also very good natured and is good as a family pet and a working dog and a show dog.